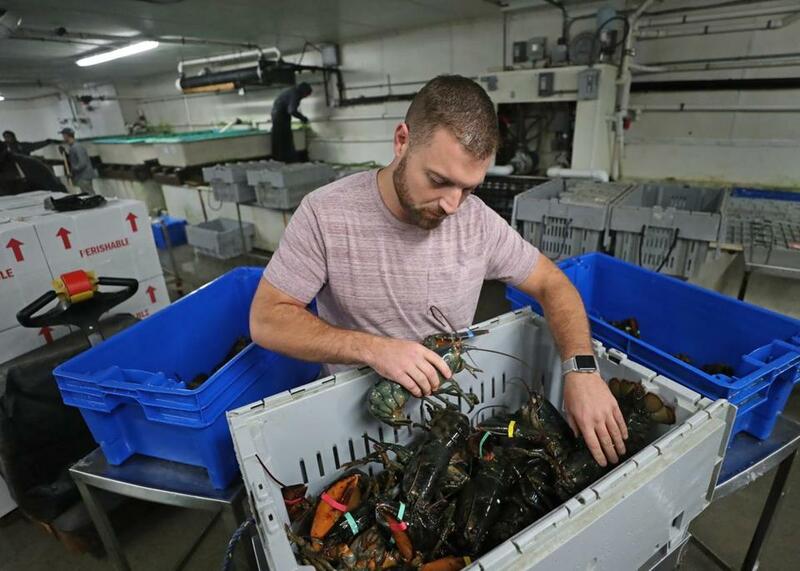 Matt Egan, a salesman for Boston Lobster Company, says the toughest part of his trade is anticipating demand. As a lobster salesman, Matt Egan likes to joke that his dad is his worst customer. “He always wants lobsters — and never wants to pay for them.” While some salesmen market products or services such as cars, real estate, pharmaceuticals, or insurance, Egan’s commodity is alive and kicking. The East Coast lobster that he sells thrives in cold water, and often is referred to as the American or Maine lobster. Not all lobsters are created equal – lobsters from the West Coast, for example, are spiny with no claws. But it’s the lobsters from around here that Chinese customers and others want — they’re tender and sweet. Egan, a salesman for Boston Lobster Company, could give a tutorial on how to sell a lobster — except that he has a cellphone constantly glued to his head as he brokers purchases with seafood dealers and lobstermen, and then sells the goods to hotel chains, restaurants, supermarkets, and local fish markets. Like a day trader, he buys low and sells high, but unlike a non-living commodity, lobsters have a shelf life. Boston Lobster tanks, located near the South Boston Waterfront, can hold about 50,000 pounds of lobsters. Its trucks regularly head to Logan Airport, where lobsters are shipped as far as Shanghai, Bangkok, Istanbul, Barcelona, and parts of Vietnam. The growing middle class in Asia is driving an insatiable demand for lobster, and Egan’s e-mail inbox is always filled with requests from overseas vendors in search of live lobsters. Egan, who is more of a meat eater himself, says he doesn’t understand the crustacean craze. Boston Lobster Company was started almost three decades ago by a commercial lobsterman, and grew to include a three-acre lobster pound in Nova Scotia and other facilities that hold almost 600,000 pounds of lobsters in refrigerated water. Recent tariffs from China on imports of US lobster have affected the industry, but Egan says it’s been pushing him to develop domestic markets in Florida and New York. (Lobsters caught in Canada and shipped out of Canada are also exempt from the tariff.) He’s also worried about climate change, as lobsters have been moving north as the ocean warms. The Globe spoke to Egan about what it’s like to be in the business of selling lobsters. “Lobsters are interesting creatures. They come in all colors, from blue, yellow or black; they pee out of their faces; and [they] can be cannibalistic. My favorite fact about lobsters is that they’re relatives to the cockroach. But this cockroach of the sea is in incredibly high demand right now. I smell lobsters all day and I really can’t stand the smell – I also can’t stand being pinched by a lobster claw. “I never imagined that I’d be dealing in lobsters. I studied criminal justice in school and was never book smart. I bartended at nights and there was a regular customer who worked in the seafood business. They had trouble finding help, and he told me I should try it out. The starting pay was low but the sky’s the limit for sales. I started out on the floor, packing lobsters, putting them in boxes, and icing them. “Some nights, we’d pack as much as a few hundred boxes — each crate contains a 100 pounds of lobsters. I did this for about six months, learning the industry. Then I started selling them. I always had a knack for sales, and now I’m at the point where I have a pretty good book of business and don’t have to make a lot of cold calls. I know who wants certain types of lobsters, the sizes they like, and who’s paying what. “I buy as cheap as I can and sell as much as I can, buying lobsters from dealers up and down the coast. Today they’re selling to me for $4 or $4.75 a pound, and then I try to resell for as much as we can. There are tight margins in the lobster industry. I think the highest I bought lobster for was $12 a pound; it was probably late spring when there can be a shortage. “Lobsters are either hard or soft shell. Right now, soft lobsters are plentiful and the hardshell lobsters are getting harder and harder to come by, pushing the price higher. “When I first started 10 years ago, lobster meat was $15 a pound; now it’s $38 to $40 a pound and we never seem to have enough of it, thanks to the demand for lobster rolls. “My friends think I have this cushy job selling lobsters, but it’s a product with a timeline – don’t sell in time, and it dies in the tank and we lose money. The clock is always ticking. I’ve been known to bring jumbo lobsters to a cook-out or party — they can grow to be 10 pounds or more.